Green waste in one form or another makes up a major component of our refuse. Garden waste makes up around 20 per cent of the material that the average British home needs to dispose of in one way or another and kitchen waste adds almost as much again – making a final total of around 37 per cent. Over recent years, composting has become a major solution to the problem of green waste – either on an individual householder basis, or in the form of larger, centralised schemes – and the results have been impressive. According to recent government figures, composting alone accounts for a third of all household recycling in England, and more than 2.5 million tonnes of green waste is processed by municipal composting facilities every year. Despite the evident benefits of composting, particularly in keeping biodegradable material out of landfills, it is not the only way to deal with this kind of waste. There are alternatives, and one of the most successful of these is a process called anaerobic digestion (AD). While composting is an aerobic process, the microbes responsible requiring oxygen to break down the waste, anaerobic digestion, as its name suggests takes place in the absence of oxygen. In many ways, what happens is much the same as goes on naturally in the bottom of a landfill site, but when AD is used as a deliberate approach to treating waste, the whole thing is much more carefully managed and controlled. Waste destined for digestion arrives at a central site and is typically shredded and mixed in just the same way as if it was heading for composting. What happens next, however, is where the differences begin to become clear. The chopped waste is mixed with liquid – in some countries, manure slurry from local farms is used, since it contains a good dose of the bacteria required for the process – and then enters a large digester vessel, which generally looks like a huge grain silo or water tank. Once inside, the resulting organic soup is warmed up to benefit the activities of the digestion microbes and re-circulated by means of paddles or pumps to stop the material settling on the bottom. The anaerobic bacteria feed on this organic mix, breaking it down to leave a fibrous material termed “digestate” – what you could call the equivalent of “compost” – suspended in the liquid. If this is sieved, dried and allowed to finally stabilise for a period, like waste-derived compost, it can be used as a soil enhancer for some kinds of landscaping projects. This on its own probably wouldn’t account for the popularity that digestion enjoys amongst some of our EU neighbours – notably Germany and the Netherlands. The big selling point really is that, just as happens when green waste breaks down in landfill, a methane-rich gas is produced. Unlike landfill gas, however, when the conditions are carefully controlled, as they are in a digester, the resulting biogas is of much better quality, being cleaner and more consistent – making it ideal for feeding into a generator to produce on-site electricity. While this obviously meets the digestion plant’s power needs – and often produces a significant excess that can be exported – it also has another bonus in the form of heat, which can be used to keep the digester temperature warm enough for the bacteria to keep working. 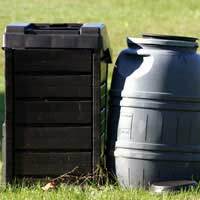 The digestion process is largely unfamiliar in Britain, but it really shouldn’t be; although it has little track record here when it comes to dealing with household solid waste, it has a long history of on-farm use and has been used at sewage treatment plants for more than a century. While the UK may not be in too much of a rush to switch from composting to AD, with energy production becoming an ever-more crucial issue, we may yet warm to the idea. As our European friends have found, it’s certainly a good alternative.